Home » Meat » Beef » What’s For Dinner? Another Post-Workout Meal! I am in a GREAT mood today! I had an awesome workout last night with a friend that I’ve been trying to catch up with for weeks! I slept well. The weather is amazing! It’s not too warm, nor too cool, and it’s bright and sunny outside! It is literally the best kind of Spring weather! And I’ve been getting some great workouts, eating some amazing food, and everything is just peachy! Actually, since it’s spring, it’s more strawberry-y. Or, maybe blueberry-y. Or something like that. But anyway, back to the topic at hand: My post workout meal. I wasn’t planning a workout last night, but was pleasantly surprised by a text message on my way home inviting me to join my friend for a workout. I immediately accepted, got home, changed, and set up today’s “What’s For Dinner?” meal to be ready for me when I returned! Put the steak in a pan to cook on “simmer” or about 2 out of 10. Slice the carrots the long way in to nice, thick slices. These are going to simmer with the beef, so they need to be thick enough to not fall apart while they’re cooking. Carefully place the sliced ginger on top of the beef, spreading it out to cover the beef. As I’ve mentioned before, this helps to keep the moisture in the beef while it cooks, making sure that the final product is nice and moist. Spread the carrots around the steak, put the coconut oil on top of the steak, season the steak with the black pepper, and season the carrots with the cumin. Now cover, and leave it – it should be ready for you in an hour, or so, when you’re done with your workout! Since we’ve done this meal before, I’ll talk more about why I love it, and less about how to do it. 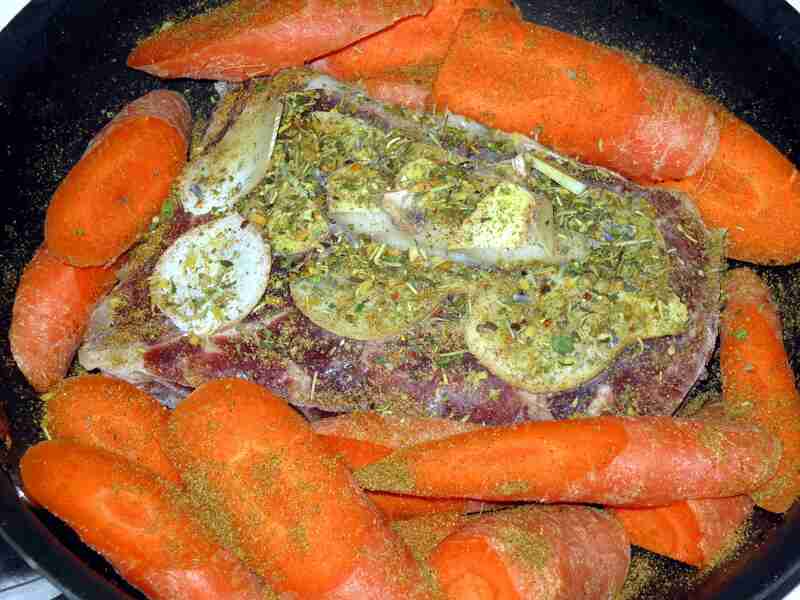 Letting the carrots simmer with the cumin and the steak juice is really delicious! The carrots on the bottom will ever so lightly caramelize, while on the top they will soften like they’re steamed. The water vapor inside the covered pan will help the carrots to absorb the cumin flavor. And because the cook time is so short, they will maintain just a bit of their crispness, so the combination of the flavor of the spice, the different textures, and the caramelized flavor from the bottom will be really great! I love slow-cooked meat. The way that the flavor of the meat, with whatever spices you’re using mix is almost always just exactly what I’m looking for. I was looking for something a little more on the spicy side last night, especially to help my muscles recover from the workout. I’ve read a lot about how much cumin, pepper, and ginger are great for assisting in recovery. Not to mention having a great source of protein, like grass-fed steak. 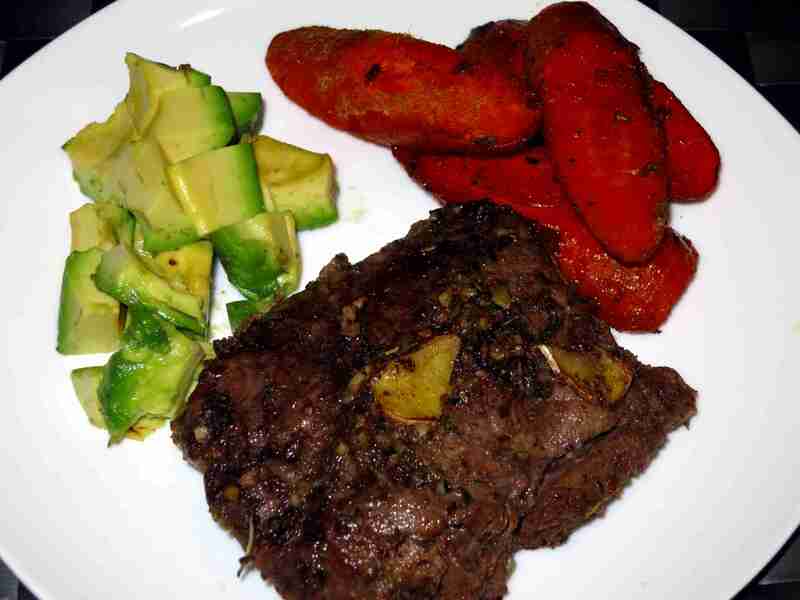 Fortunately, the flavors of cumin, pepper, and ginger seem to mix really really well in a slow-cooked steak! So I get to eat something that will aid in my recovery, while still tasting delicious! What a combination! I was asked recently why I don’t do any diet-related posts, why my posting is almost entire food-specific. Would you like to see some posts from me that are diet or exercise specific posts? If so, how many? I LOVED the crock-pot smoked meat post the other day, and I really can’t wait to give it another try! What kinds of things would you guys like to see me try? Which flavor combinations (alcohol? vinegar? other fruits? tubers/veggies?) and/or meats (pork, chicken, beef, turkey, fish) would you like to see me use? And are there any other ingredients that you’d like to see (cedar plank? applewood plank? juniper berries? fresh-cut pine boughs?) me try out? This may be the most important question: I am actually planning on doing a “Weekend Food Commentary” post for this weekend. Do any of you have a topic that’s been sitting in your head that you’d like to see me tackle?